The winter to spring flowering Correa pulchella may well be the best of all of the species of this wonderful group of plants. 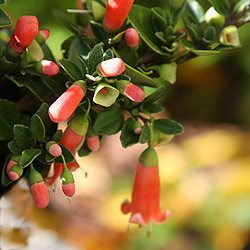 With many hybrids developed, horticulturalists have invested a lot of time into making many new varieties available for sale to the Australian gardener. These are an excellent low growing plant for the garden border, native garden or rock garden. 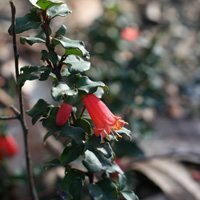 This is a plant that flowers from Autumn through to Winter with lovely long bell shaped flowers set against dark green foliage. A number of varieties are available for sale including numerous cultivars. Flowering from autumn through to spring they add color to the garden over a long period. Growing to about 1m, Correa pulchella forms a nice rounded mound, frost resistant, full sun to part shade and nice blue green foliage. 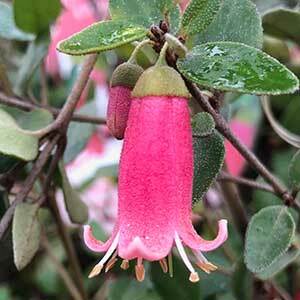 One of the most important factors in growing Correa pulchella is to avoid humid conditions. Good air flow and a well drained soil can alleviate many problems. Common Name – Native Fuchsia, Dusky Bells. Height – Varying from near prostrate forms to around 1 metre. Flowering Time – Winter through to Spring. C. pulchella ‘Pink Mist’ and Correa ‘Carmine Bells’ are two popular Correa cultivars of this low growing mound forming Australian Native plant.